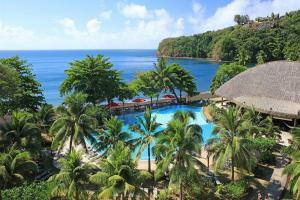 165 deluxe air-conditioned rooms and suites feature large balconies and stunning views of Matavai Bay. 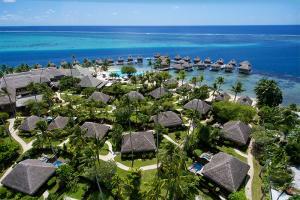 This beautiful resort is set at the edge of a lagoon and affords dramatic views of Moorea. Just minutes from the airport and downtown Papeete, this luxurious resort affords magnificent views of Moorea from its 30 tropical acres. Rates are based on roundtrip air travel to/from Los Angeles, CA (LAX), and are per person, based on double occupancy in Run of House or Garden View room categories. Advertised vacation rate(s) valid for select travel 5/31 - 7/19/17. Must be booked by 5/15/17. Rates for other travel dates may vary. Rates based on current currency exchange rates as of 4/3/17; currency exchange rates subject to change without notice. 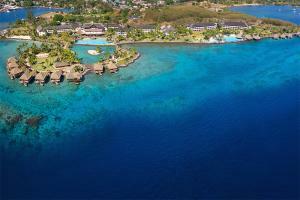 Rates, terms, conditions and itinerary are subject to availability. Certain restrictions apply. Rates shown include government-imposed fees and taxes. Rates are current as of 4/3/17; at the time you purchase your package, rates may be higher. Airline fees for optional services, including, but not limited to, fees of up to $0 per bag for the first checked bag and up to $75 per bag for a second checked bag, may apply. Baggage fees are current as of 4/3/17. Airline tickets are non-refundable and subject to airline change/cancellation penalties and rules, including pre-flight notification deadlines. Fees and policies vary among airlines and are subject to change without notice. Please contact the airline directly for details and answers to specific questions you may have. Additional restrictions apply. Advertised rates include any applicable daily resort fees. Tahiti Summer Sale Offer: Valid on new bookings made 5/1 – 5/15/17 for select travel 5/31 – 7/19/17. Allocated seats and rooms are limited and subject to availability. 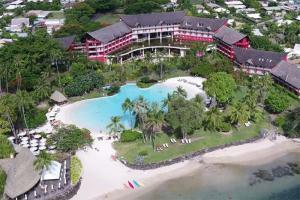 Minimum/maximum 6-night hotel accommodations at participating property (Tahiti only vacation) or minimum/maximum 1-night hotel accommodations at participating property in Tahiti and minimum/maximum 5-night hotel accommodations in Moorea (Tahiti and Moorea combination vacation) and roundtrip airfare required on 5/31, 6/7, 6/14, 6/21, 6/28, 7/5, 7/12, 7/19. Not responsible for errors or omissions. [Pleasant Holidays acts only as an agent for the various travel providers shown above.